If you like this blog, then you’ll really like Home Energy Magazine! If there’s one thing contributing editor Steve Mann learned while attending the 2010 Passive House Conference in Portland, Oregon, it’s that the Passive House approach is anything but passive. In this issue of Home Energy, Steve explains the history of the Passive House standard, where it stands today, and what its future holds. Steve is a HERS rater, Green Point rater, LEED AP, Certified Energy Analyst, serial remodeler, and longtime software engineer. Read the excerpts below to learn why senior building science consultant John Tooley says we need to Raise the Bar for Home Performance, and how a standard retrofit package can save a homeowner money in The Robo Retrofit House. This issue also features real-life horror stories from the field of energy auditing and a look into how students at Syracuse University experienced a Multifamily Performance Program in on-campus housing. Click here to access the current issue. If you are a current online subscriber to Home Energy, click here to log in. When I give talks or do energy audits, people want to know the “best” ideas for saving energy. You know – the things that cut your energy bills in half and don’t cost much to implement. Interestingly, this isn’t as crazy as it sounds. I’ve based my career on trying to give out as much practical information as possible. The theory is, if it’s easy and you can afford to do it, you’re much more likely to actually improve your home. This is as opposed to the idealist’s approach which promotes only doing things if you’re going to do them perfectly. Without boring your further, let’s dive into five things that you can do to save energy in a meaningful way. By far the most important step to take is to learn how you and your home are using energy. This lets you prioritize your energy saving measures in a way that is most meaningful. I’ve seen people spend weeks caulking ares of their home that make absolutely no difference while leaving huge problems untouched. I always recommend getting an energy audit as a starting point. However, the purpose of this article is not to get you to buy energy audits, it’s to teach you how you can do things yourself, so I’m going to skip that method. The first thing is to look at your own utility bill. I can show you spreadsheets showing how other homes act, but there’s nothing like looking at your own utility bill. 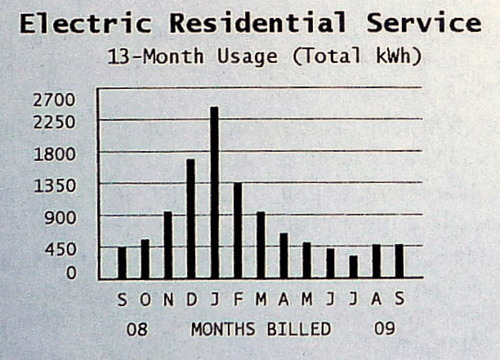 Almost every electric bill has a graph like this one, showing a year or 13 months of usage data. The vertical axis shows how much energy is used each month. In this case, it’s scaled from 0 to 2700 kilo-watt hours, or kWh. Definition: a kWh is the amount of energy used by ten, 100 watt light bulbs in one hour. This is the same as one, 1000 watt heating pad. If it adds up to 1000 watts and it runs for one hour, it uses 1 kWh per hour. I hope that’s clear, because everything about electricity consumption depends upon you understanding what a kWh is. On the horizontal axis is months. In this case, it runs from September of 2008 to September of 2009. This lets you compare this year’s bill for September with last year’s bill. This is very handy since it shows you at a glance if anything has changed dramatically since last year. Look at the pattern of usage. The graph shows similar electrical consumption during September, October, May, June and August. Each of these has a total usage of about 450 kWh for the month or about 15 kWh per day. I’d include July, but that actually shows a bit less consumption. Maybe the homeowner went on vacation for a week in July? The graph shows electric usage increasing in November, December, peaking in January, then dropping in February, March, and April. This makes sense too since January is consistently cold, so you’d expect the most usage when it’s cold. So everything makes sense. Take a step back. What does this graph say about the house? It says that the occupant is using electric heating in an amount that is related to the outdoor temperature. I’ll tell you a secret – this house is heated with oil, so somehow, the owner was paying a double heating bill, once for electric and once for oil. So just looking at the electric bill tells me that there’s something very wrong with this home. After all, if the home is heated with oil, why are they paying for an extra 2,000 kWh in January? That’s $320 in added electric costs (in this area). Over the course of the entire winter, they’re using 5,200 kWh, or about $830! We’re learning an awful lot by looking at one part of an electric bill. Without even looking at the house, you know that there’s something happening here that’s dramatically increasing their electric bills in the winter. Common sense shows us that the usage corresponds to winter temperatures so it’s extremely likely that they’re using electric space heaters somewhere in their home. It’s also telling us that they don’t use air conditioning during the summer. If they did, the graph would jump up during July and August, which can be pretty hot and humid in these parts. Go back to our earlier observation that most of the non-heating months show an electric consumption of 450 kWh per month. The average usage during the low-usage months corresponds to the baseline electrical usage. This is the amount used for things excluding seasonal loads like heating and air conditioning. For most homes, the baseline electrical usage includes electricity used for televisions/electronics, electric lighting, clothes washers/dryers, computers, dishwashers, electric water heaters, etc. – things you use all year long. In this particular case, they use 450 kWh per month, or 15 kWh per day. This is comparatively low. Most homes I measure have 25-50 kWh per day consumption as the baseline, so the graph also tells us that there is nothing that is excessively sucking down electricity in the home during the non-heating months. We’ve spent a lot of time looking at the broad usage patterns. What about specific consumption? Suppose we saw something that caught our eye on the graph, like high baseline usage? What then? Recall in the definition of kWh I wrote: “a kWh is the amount of energy used by ten, 100 watt light bulbs in one hour.” I defined it that way because it frames an abstract term “kilowatt-hour” in a way that anybody can wrap their brain around. Ten 100 watt lightbulbs burning for one hour. Easy! So, a home that uses 15 kWh in a day is using as much as those ten lightbulbs would burn during the waking hours. That’s not bad considering it includes all the washing, drying, dishes, television, etc. On the other hand, if you found that the home had a baseline of 45 kWh, that would be like 30 bulbs burning all day – ouch! In fact, when I see a high baseline electrical usage, one of the first things that I’ll do will be to walk around the house, basically counting lightbulbs. Anyway, I digress. The point should be well taken. Sometimes, the cause of your high consumption is blindingly obvious! That was an easy (but very common) problem. What about the harder ones? Well, sometimes, you just have to measure things, using a kill-a-watt meter like the one shown at the top of this post. 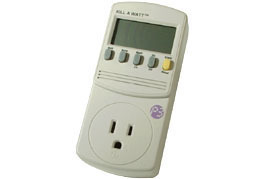 This is a simple to use electric meter that any homeowner can use to measure the load of things that you plug in. For example, if you want to learn how much electricity that old fridge in the garage is using, just plug it in for a day and you’ll get a very accurate measurement. Side note: occasionally, I’ll post links like this to items in the Ted’s Tips Amazon store. I’ve put together this store to hold all the items that I refer to on this blog so that you’ll be able to find them in one convenient place. Originally, I was linking to a lot of different sites, but then people would ask me where they could purchase them. Since I’ve been an Amazon user for years and know them to be extremely reliable and have low costs, I figured it was easiest to go this route. Anything you purchase there helps support this site. Thanks! What Things Should You Measure? You should also make note of the following light fixtures. Keep track of the wattage of the bulbs and the length of time they burn each day. I’m going to stop here for the day. This is more than enough to get you started doing your own home electrical consumption audit. If you follow these suggestions, learn how to read your utility bills and figure out how much energy you’re using, you’re well on your way to lowering your electric bill, maybe substantially. So get cracking – the watts are-a-wasting. Sorry, I couldn’t come up with a snappy title for this one. This is about money and energy, so it’s a bit dry. After my recent post on water heating, a friend dropped me a note and reminded me that the economics vary considerably depending upon the cost of the fuel. This is absolutely true, though unless you’ve studied a lot of utility bills, you might not realize just how much energy costs can vary. Depending on where you live, the cost of each can vary widely. To complicate matters further, the price varies throughout the year, usually in proportion to the demand. So, for example, heating oil cost is the greatest in the dead of winter when you need it the most. For the rest of this post, unless I note otherwise, I’ll be comparing fuels based upon their normalized cost. That is, I’ll be comparing the cost based upon the same amount of useful energy contained in the fuel. This can get confusing because most people refer to cost per gallon, but that’s meaningless because a gallon of liquid propane contains far less energy than a gallon of heating oil and you can’t even buy a gallon of natural gas or electricity. You can think of it as about the energy contained in half a tank of gas. So the million dollar question is, how do fuels compare based on an equivalent amount of energy that they’re capable of producing? To answer this, we have to look at a range of prices. For example, on the West coast and in the Northeast, fuel costs are quite high. Electricity in most areas is $0.15-$0.20 per kilowatt hour (KWh). That means the cost per MMBtu of electricity ranges from $43.94 to $58.58. But in some areas, or under certain rate plans, electricity is as low as $0.07 per KWh so the cost per MMBtu drops to $20.50. So you see, this really complicates cost comparisons. That’s a three times range of cost. And it only gets more complicated when you compare multiple fuels! To simplify matters, here’s a table with each fuel, a range of costs, and then the corresponding range of costs per million BTUs. Now the picture is getting a little clearer. You have natural gas at a low cost of $7 per MMBtu up to Electricity at almost $59 per MMBtu. That’s quite a range for the same amount of energy! Let’s make this even more interesting! Instead of an abstract term like MMBtu, let’s convert this to “1,000 gallons of hot water”. I have to make a few assumptions here because this new calculation depends upon the starting and ending temperature of the water. For this, I’m basing the calculations on 50 degree water coming in and 130 degree hot water. What does the fuel really cost? Notice that in all this discussion, I’ve kept things simple by just talking about the energy contained in the fuel. That assumes 100% efficiency. Unfortunately, nothing happens with 100% efficiency so we now have to complicate matters further by considering the actual efficiency of each system. For these calculations, I’m going to use the typical efficiencies achieved in most households. You have to build your own spreadsheet if you want it to be accurate for your own situation. Water heaters are rated by their “energy factor.” This is a rating based upon the combustion efficiency and the heat loss of the storage tank, all measured under “typical conditions” whatever that means. The energy factor is a number from 0.0 to 1.0 representing 0% efficient to 100% efficient. I don’t know why they didn’t just use % efficiency, but they didn’t, so just remember an EF of 1.0 is perfect. Natural gas, propane or standalone oil water heaters have an EF of about 0.59. Yes, you read that right – your conventional, combustion type water heater is only 59% efficient, if you’re lucky. An electric storage tank water heater has an EF of about 0.90, or 90% efficient. There are other technologies and types of water heaters, but in practice, these numbers apply to the vast majority of the homes in the U.S. This tells us that the actual cost to heat your water is considerably different than what I showed in the tables above because the efficiency changes things, making electric water heaters much more appealing if you have cheap electricity. Just for completeness, I’ll convert the table above to include these efficiencies. 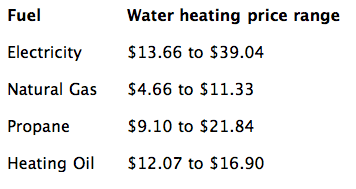 So the following table represents the cost to heat 1,000 gallons of water in a real water heater. This final table represents the price range that a consumer would expect to pay to heat 1,000 gallons of water based upon typical water heater efficiencies and the range of fuel costs across the United States. It has been a long journey, but if you followed it, you should now be able to figure out how much it’s really costing you to take a 20 minute shower or wash clothes with that old washer. In another post, I’m going to describe how you can analyze your own utility bills to see how much fuel you’re actually using for hot water. All these numbers are great, but what’s really important is how much it’s costing you to heat your water based upon your actual consumption.